Researchers in Britain have found a link in horses between higher circulating levels of a key molecular messenger that helps to regulate energy levels and obesity. They say their findings suggest that circulating myostatin levels and/or associated factors might prove useful as a biological marker for metabolic conditions, including obesity. 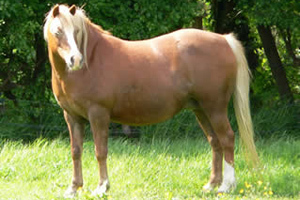 Obesity is a widespread problem across leisure horses and ponies in industrialised nations, with a high prevalence in Britain. The well-documented negative impacts of obesity on health and performance have led to obesity being considered one of the major welfare issues in horses and ponies facing industrialised nations today. Obese animals are at greater risk of developing insulin dysregulation and laminitis, although the precise mechanisms linking these conditions are not yet fully understood. The researchers from the University of Liverpool’s Department of Obesity and Endocrinology and the Equine Studies Group at the Waltham Centre for Pet Nutrition said the largest metabolically active tissue in the body of the horse was skeletal muscle, comprising around 40 percent of body mass. Skeletal muscle was a key determinant of resting energy use and therefore played a vital role in maintaining energy balance, they said. Communication with other organs, including fat tissue, is achieved through secretion of molecular messengers into the circulation, called myokines. One such myokine is myostatin, a member of the transforming growth factor β (TGFβ) family of secreted growth factors. To date, myostatin has been widely characterised as a potent negative regulator of skeletal muscle mass, and ways to inhibit its function as a potential way to increase muscle mass in diseases such as muscular dystrophy and cancer cachexia have been explored. The researchers, Philippa Morrison, Chen Bing, Patricia Harris, Charlotte Maltin, Dai Grove-White, and Caroline Argo evaluated gene and protein expression of myostatin and its receptor, ActRIIB, in the fat and muscle of six lean horses and six obese horses. They also evaluated myostatin concentrations in the blood serum of the animals. Average circulating myostatin concentrations were significantly higher in the obese animals than the lean ones, they found. In addition, there was a significant positive association between these levels and myostatin gene expression in skeletal muscles. Myostatin gene expression across all skeletal muscles studied was significantly greater in the obese animals compared to the lean animals, they reported. In contrast, ActRIIB gene expression was significantly lower in obese animals in three out of the four skeletal muscles studied. While myostatin gene expression was considerably lower in fat tissues compared with skeletal muscles, expression was significantly greater in the crest fat of obese animals compared with lean animals. No difference was observed between lean and obese animals for ActRIIB gene expression in fat tissues. Together, the results provided further basis for speculation that myostatin and its receptor may play a role in equine obesity, they wrote. The researchers said their data provided some evidence that the “myostatin system” may differ at both the gene and protein level in lean and obese horses and ponies. Their findings have been published in the open-acces journal, PLoS ONE.